Hey everyone! I know many of you are here to view my photography, but I wanted to mention that I also sell cameras and lenses as an ambassador for Unique Photo in Fairfield, NJ. I worked full-time in the Unique Photo showroom for 7+ years before moving to Florida. Over those years I helped get the right gear in the hands of photographers all over the USA, at the best prices possible. The good news is that as an ambassador, I can still help you with your next and possibly most important photography gear purchase. 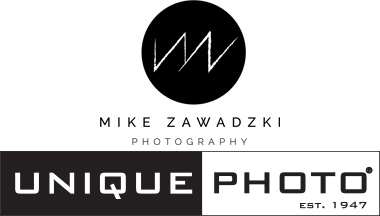 Unique Photo is a family owned business that has been in business since 1947 and an authorized dealer of all major photography products. Used gear is also readily available through Unique Photo, so please don't be shy to inquire about any used cameras or lenses you may be looking for. A photo of me working the sales counter during a big expo style event in my earlier years at Unique Photo in Fairfield, New Jersey. I miss the people, but not the neon blue shirt. As a professional photographer, it is beneficial to have a concierge style point of contact for the best possible service. I pride myself on providing top notch customer, and technical service even after you've received your purchased item(s). Once you become a customer of mine, you will also be added (if you desire) to my private Facebook group where many photographers network and help each other with technical and business advice! If you aren't entirely sure what you're looking for, free to browse Unique Photo's complete catalog on their website, but be sure to complete this contact form below to get the best possible pricing from me. If you have any questions regarding the legitimacy of my operations or ambassadorship, you can contact Unique Photo directly at 1-800-631-0300. I also have a number of references from customers who purchase through me on a regular basis. Thank you for your photography gear inquiry, you will receive a response within 12 hours! If your request is more urgent, you can reach me directly at 973-941-2940.